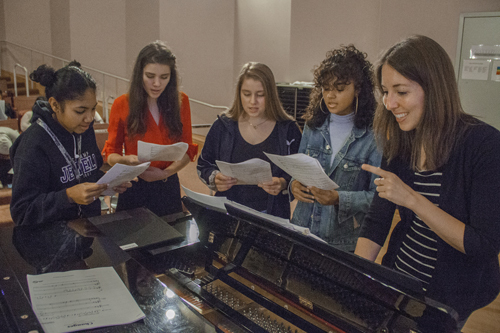 Since 1985, The CREC Greater Hartford Academy of the Arts has been providing high quality professional training in the arts to high school students in and around the Hartford Area. We are proud to have been a recipient of many awards over the years that recognize us for our excellence. Starting 19-20 School year, GHAA Full Day start time will be at 7:30 a.m. with dismissal at 2:25 p.m. There are big changes coming to the Arts Academy in the 2019-2020 school year. Click below to learn more about the programs, our information sessions, and how to apply. May 3, 4, 10, & 11; 7:30 p.m. Using the sounds of the Caribbean, Once on this Island weaves the tale of a peasant girl who falls in love with a wealthy boy from the other side of the island. After she saves his life she vows to be with him, even though they are from two completely different social classes. However, the gods have a little more in store for her than she realizes, and she will have to make a very tough decision regarding her future and most importantly, her heart. Both the 1991 original Broadway debut and the 2017 revival were nominated for 8 Tony’s, winning Best Revival of a Musical in 2018. The Theater of the Performing Arts houses a 600-seat, state-of-the-art proscenium theater, a 120-seat flexible theater, classrooms and support spaces. Visit the Theater of the performing Arts Page for performance and event calendar, ticket information, rental information, and more. Multidisciplinary workshops for students in 6th-12th grade with a desire to develop their skills in Acting, Creative Writing, Dance, Visual Arts & Voice at the Learning Corridor Campus. We are offering two 1-week sessions. Click for more information below. Do you need a copy of your transcript? Fill out the Transcript Request Form Below and we will be happy to send one out to you. If you need a Community Service Form, please download from the link below and return it to the Student Activities Office. Musicians from the Greater Hartford Academy of the Arts ended their week dancing to the sounds of funk. On Thursday, April 21, music students all gathered in the recital hall where they were given a free concert from Afro Cuban Funk group Cimafunk. The concert was just one of many stops on their northeastern tour which included Hartford’s Real Artways that same night.